Even as a vegetarian, I struggle to consume the recommended amount of daily fruits and vegetables. Salads are my go-to for lunches and dinners, but like a creature of habit, they tend to be comprised of the same fruits and vegetables. Awhile back I bought a juicer in an attempt to increase the diversity of the fruits and vegetables I consume and ensure the amount was sufficient. Consistent with end-of-year-itis, I started getting lax with my diet, consuming more carbs than is optimal and further decreasing my intake of fruits and vegetables. Since we’re at the start of the new year, I thought I’d regroup and make a plan to start consuming more fruits and vegetables. While sneaking them into pasta or mac and cheese is a simple solution to the challenge, I decided that fruit and vegetable juices and smoothies would be ideal for packing in those vital nutrients. In an effort to include more antioxidant-rich foods into my diet, I picked up a few containers of fresh blueberries during my recent shopping trip. I prefer to shop seasonally because the prices on in-season fruits and vegetables is lower and the quality is generally better. I had decided that I wanted to juice the blueberries along with a few other fruits and veggies, so I picked up fresh strawberries, a few cucumbers, a lemon and some coconut water. 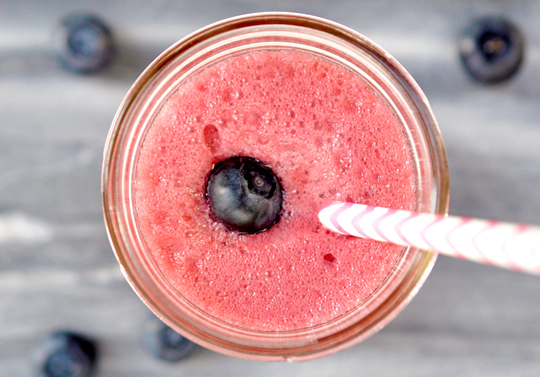 Along with the antioxidants present in the blueberries and strawberries, this Blueberry Strawberry Coconut Juice also includes potassium (from the coconut water), and phytonutrients (from the cucumber and lemon). 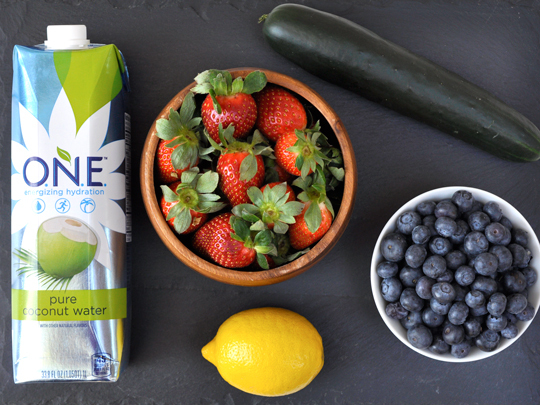 This juice is delicious, refreshing and hydrating. I love the perfect balance of sweet and savory flavors. If you’re looking to start a new healthy habit, juicing is a great way to pack in vital nutrients from a diverse selection of fruits and vegetables. Remember that freshly squeezed juices should be consumed immediately in order to reap the maximum nutritional benefits. Sprouts wants to inspire you to Start Fresh with Healthy Habits. Throughout the month of January, you can participate in the 21-Day Healthy Habits Challenge with the opportunity to win groceries for one year ($5,000 in Sprouts gift cards). Simply sign up for the challenge and enter daily by sharing how you achieved your healthy habit for the day. If you visit Sprouts.com, you’ll also find articles to help inspire healthy habits for the new year. In addition to Sprouts 21-Day Healthy Habits Challenge, I encourage you to join the Sprouts daily Photo Challenge on Facebook, where you’ll have an opportunity to win giveaways from your favorite wellness brands, including Organic Valley, Kashi, New Chapter, Tiesta Tea, MegaFood and Kala. Prizes include a TREK bike, yoga mats, fitness trackers and a Vitamix. Be sure to share your healthy habits on social media using the hashtag #HabitYourWay. This is too good. I think I can make Blueberry Strawberry Coconut Juice a habit, Oh wait, what really concerns me more and more is the WATER QUALITY in OC cities. Horrible chemicals in our tap water.